My emergency kit for the office contains a wide range of things! From scarves, to shoes, to hygiene and cleaning products. I keep it all close and handy in one of my desk drawers. If a list of over 15 items may seem like a lot, I assure you, each and every one item on this list will be useful at some point. Providing you with a solution to some of the small stuff at work that can cause stress. After lunch you realize your shirt is stained, or you just ruined your stocking and a meeting with your boss is coming up. You have plans to meet some friends after work and need to refresh before you leave. The air conditioning starts to ramp up and you’re suddenly freezing. Having an emergency kit at the office allows you to have the right tool, at the right time, to deal with the unexpected. It simply contributes to making your work life a little easier. So whether it’s for your comfort, proper hygiene, or to keep your look well polished in front of clients. Build your own emergency kit to be certain to have the right tool at your disposal, when you need it. Pashmina scarf – Choose a very light pastel color in blue, pink or cream so that it fits with many of your outfits. I love pashminas because they are light and warm. They’re often made of cashmere but some brands also offer them in lighter fabrics. Whether it’s summer or winter, I always like to have my pashmina close. With men wearing suits and women often wearing skirts and tops without a blazer, it seems like the temperature is never quite at right degree in our offices. Ballerina shoes – Or other low-heel comfortable shoes. It feels great to change shoes when comes lunch time. You can comfortably do your errands or take a nice walk around a few blocks to refresh your brain. Plus, you won’t ruin your feet, or your heels! Comfortable pumps – Ideally black (mine are Geox in black patent leather and really comfortable — even with their 3” heel). I really appreciate having the choice to switch to other heels sometimes when I get sore feet. I’m probably not the only one who loves the stiletto look, but not the comfort. Also, when comes spring time and I start wearing my shoes without socks, I’ll often get blisters. So instead, I’ll start wearing them for only a portion of the day until my feet get accustomed to the ‘no socks feeling’ again. Shoe inserts and insoles – Your feet have a very tough job, you need to take care of them. Sometimes I used them to add a bit of cushioning for better comfort. And sometimes I need them to make my shoes narrower because my shoes often stretch after a while. It takes a few trial and errors to find the right inserts for your feet but once you do, you’ll be really happy you went through the trouble. 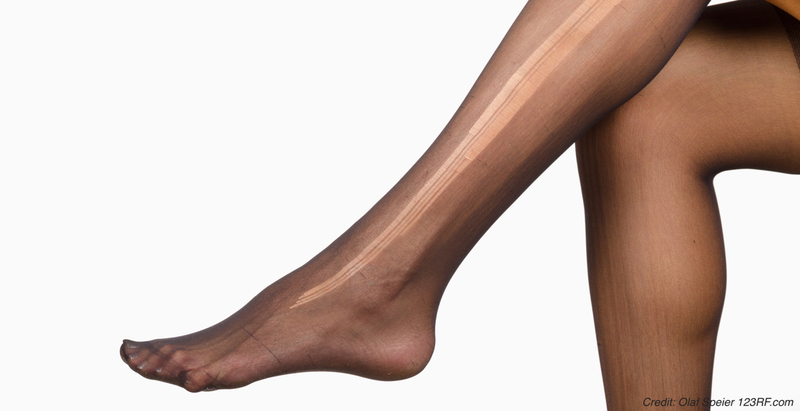 Nylon stockings – Pick an ultra sheer beige color so that it matches with any skirt. Isn’t it always on THE day where you have an important meeting planned that you’ll suddenly notice you have a runner in your pantyhose? Small umbrella. Whether at lunch time or to get back home after work, going out in the rain will be less of a bummer. Adhesive roller. You get to work in the morning and realize your blazer is full of your cat’s hair. The adhesive roller will be a saviour. So quick and easy to use. Instant stain remover – I use the Tide To Go crayon, but also read about Shout Wipes being a close second favorite. Quite embarrassing to have a tomato sauce stain on your white shirt for your afternoon meeting with your boss, wouldn’t you say? Instant stain removers can do magic with most fabrics. The trick is to not waste any time after the ‘incident’ happens. Sunscreen sprays – For face and body (I use a makeup setting spray with 30 SPF for my face, and a Neutrogena invisible spray for my body). The sun’s UV rays are so damaging to our skin. And the SPF cream you may have applied in the morning will not be protecting your skin by the time lunch comes. So a few quick sprays over your face, neck and arms before you leave will make that nice lunch on a terrace in full sun much more enjoyable. Tylenol for occasional headaches – Or whatever brand works for you. Thankfully I don’t often get headaches, but when I do, these come very handy. Nail file. That speaks for itself. Hand sanitizer – Often in the form of alcohol-based gels. Best way to kill the germs you picked-up in your subway or bus ride getting to work in the morning. Hand cream. With all the hand washing and using hand sanitizers trough out the day, don’t forget to regularly hydrate your hands. Toiletry pouch with deodorant, toothpaste & toothbrush and dental floss. Good hygiene makes for a more enjoyable workplace. This can mean brushing your teeth to get rid of bad breath after eating something spicy. Or, to freshen up by reapplying deodorant before you go out with colleagues or clients after work. There you have it. Simple solutions, for a simpler work life! Hope you find it useful. And let me know below if you have any other great ideas to add to this list!